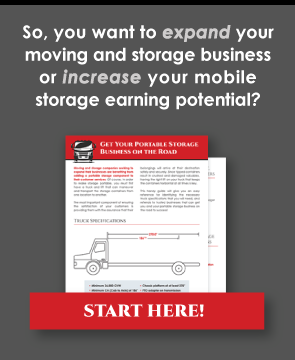 Successfully adding mobile storage to your moving business requires overcoming a number of challenges. However, these challenges aren’t much different from other challenges that your business has already overcome. While some of these challenges listed below may appear daunting at first glance, the reality is these mountains are mere molehills on the road to a bright and prosperous future. Lenders are leery of making loans for mobile storage containers because they are hard to track and because the cost of each container represents only a fraction of the overall loan amount. This makes them a flagged investment for lenders who worry the containers can easily up and vanish, leaving them with no collateral to collect should the business go belly up. However, these challenges can be overcome by either seeking investors or by finding mobile storage industry specific lenders i.e. ClearView Financial. Another way to get around lenders’ concerns is to use ISO containers. Lenders are less concerned with these and many can be purchased second hand and repaired to like-new condition, which saves you on the purchase price and lowers the amount of the loan you will require to get started. If you have five different kinds of trucks, that means you have five different kinds of parts and maintenance requirements. This adds expense and can make it more challenging to keep your fleet fully operational. The same is true with containers and the more types of containers you have, the more difficult it will be to look after them properly. Moreover, if your fleet looks like a hodgepodge, then consumers will see this, and it will reflect negatively on your mobile storage operations. Thus, standardization is key to surmounting the challenges of brand recognition and fleet management. Liability is always a challenge, whether it is a rock that breaks the windshield of a car your trucks pass going down the highway or a client who claims your container’s door smashed their finger. The best way to protect your business is to ensure your insurance policy covers you against any and all potential liability. While a solid insurance policy will cost you more per month, it is worth the investment to ensure that a lawsuit doesn’t sink your ship. In addition to a solid insurance policy, it is critical that your leasing agreements clearly spell out user responsibilities and the limits of your liability. Hiring a good lawyer that knows how to draft ironclad leasing agreements is one investment you will never regret making. Mobile storage means that you will be storing client possessions for a period of time that can range from a day or two to months on end. This means that you need to secure these containers until clients are ready for them to be delivered. Cameras, secure fences, and professionally monitored alarms are the best ways to do this. Not only can these deter potential thieves from stealing, but they also protect your brand reputation from being stolen as well. No one likes getting an audit notice, and it’s imperative that you keep your financial and rental records in order at all times. Tracking the revenue is key to remaining compliant, managing your marketing efforts, and ensuring you are getting paid for the high-quality service being provided to your clients. Ultimately, the challenges of adding mobile storage are no different than the other challenges inherent to operating a business. The more carefully you consider all the potential pitfalls and risks, the less likely they will be to derail your operations and put a dent in your services.